One of the best perks of working at Guitarist's Forum is the opportunity to showcase a fine talent that deserves a much wider audience. Richard Kuncicky first picked up a guitar at age nine! Through the years, in both New York and his native Florida, he's played Rock & Roll, Country Swing, and Jazz. Finally, Rick decided to blend his love for Jazz with his clean, precise fingerstyle/classical technique to create a new body of exciting guitar arrangements. The mix worked, and ever since he's been one of the lucky (and few) to build a successful full-time career as a solo fingerstyle guitarist. For over 15 years Richard Kuncicky's fingerstyle guitar solos have entertained travelers from around the world as they pass through quaint Old Saint Augustine, Florida. Rick can be heard five days a week at the Cafe Alcazar and The Reef, and around town at art galleries, inns, and private functions. Logging over 300 performances a year, Rick's fingerstyle arrangements of standards and pop songs are polished, proven crowd pleasers. 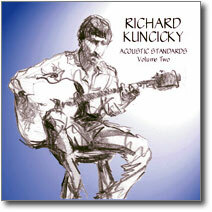 Rick has selected two dozen of his best pieces for his Acoustic Standards series. Among our favorites are Satin Doll, As Time Goes By, When You Wish Upon A Star, If I Only Had A Brain, Lady Be Good, Honeysuckle Rose, Its Only A Paper Moon, and Mona Lisa-- but we really could list every track! What we liked best is these are not covers of the classic Atkins, Byrd, or Klugh arrangements. Each track is an original Richard Kuncicky arrangement. Rick's style is all his own, influenced by the players he respects: Chet Atkins, Charlie Byrd, Earl Klugh, Joe Pass, Guy Van Duser and George Van Eps. In this age of alternate tunings, guitarists should note that Rick's arrangements are all played in standard tuning. This makes them ideal for live performance, where breaking the flow to retune is undesirable. Keeping things in standard tuning also facilitates improvisation, because you are always in familiar territory. Check out Rick's two CDs. Both are very highly recommended!